Loot Crate is a monthly service in which you receive geek-friendly merchandise at a discount, grouped around a particular theme. The anniversary theme continues with Tetris, celebrating its 30th anniversary this year. 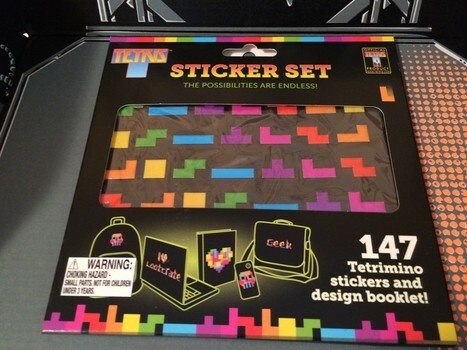 To celebrate, Loot Crate included Tetris stickers. The funny thing about Tetris is that in two-dimensional format it's a lot like Minecraft, 147 of them to be precise. Which of course means my seven-year-old boy claimed it. The accompanying booklet tells you how to make the alphabet, a heart, and a skull. My son plastered his carrying case for his Minecraft books with his initials, a skull, an electric guitar, a sword, and a man. Minecraft, you continue to bolster the geek kid economy. The boy gave it five stars.